Carl Icahn, the billionaire activist investor who spent most of the year trying but ultimately failing to get control of Dell, said in a regulatory filing that he has boosted his holdings of Apple. In a filing with the U.S. Securities and Exchange Commission, Icahn’s company, Icahn Enterprises, disclosed an Apple stake worth nearly $1.9 billion as of Sept. 30. But in a letter to Apple CEO Tim Cook, released to shareholders last month, Icahn disclosed that his stake has grown to 4.7 million shares, which, as of yesterday’s closing price, would be worth $2.5 billion. 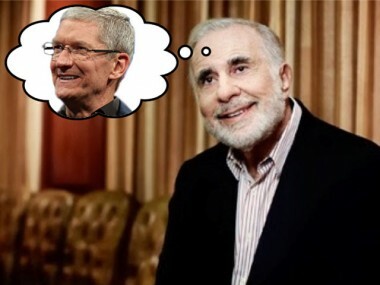 Icahn has been bugging Cook to boost Apple’s share buyback to $150 billion, arguing that doing so is a “no brainer.” The pair had dinner together on Sept. 30 to discuss the idea. Apple has opted instead to stand pat on its $60 billion buyback plan — one since endorsed by investor Warren Buffett — and said that, including dividend payments, it is on track to return about $100 billion to shareholders. Its buyback program is the largest ever announced. During the last five quarters, Apple has bought back shares and paid dividends worth a combined $36 billion. Of that, $2.8 billion in dividends and $5 billion worth of buybacks occurred last quarter. His point is that Apple is undervalued. Once you back out its cash position — now $147 billion — it trades at a valuation of only nine times forward earnings, versus a ratio of 14 times forward earnings for the rest of the companies listed in the Standard & Poor’s 500.